SONOSIM SUMMARY: This observational study evaluated the use of ultrasound to differentiate between esophageal versus tracheal intubation in patients who received either emergency intubation during CPR or rapid sequence intubation. Current techniques for ruling out endoesophageal placement include measuring end-tidal carbon dioxide levels. In this study, ultrasonography was used to both visualize the endotracheal tube within the trachea as well as confirm lung sliding. Findings suggest that ultrasonography is faster than measuring end-tidal carbon dioxide levels and is otherwise as effective as capnography for assessing endotracheal tube placement. In this study we aimed to evaluate the success of ultrasonography (USG) for confirming the tube placement and timeliness by tracheal USG and ultrasonographic lung sliding in resuscitation and rapid sequence intubation. This study was a prospective, single-center, observational study conducted in the emergency department of a tertiary care hospital. Patients were prospectively enrolled in the study. Patients who went under emergency intubation because of respiratory failure, cardiac arrest or severe trauma included in the study. Patients with severe neck trauma, neck tumors, history of neck operation or tracheotomy and under 18 years old were excluded from the study. A total of 115 patients included in the study. The mean age was 67.2±17.1 with age 16-95years old. Among 115 patients 30 were cardiac arrest patients other 85 patients were non-cardiac arrest patients intubated with rapid sequence intubation. The overall accuracy of the ultrasonography was 97.18% (95% CI, 90.19-99.66%), and the value of kappa was 0.869 (95% CI, 0.77-0.96), indicating a high degree of agreement between the ultrasonography and capnography. The ulrasonography [sic] took significantly less time than capnography in total. Ultrasonography achieved high sensitivity and specificity for confirming tube placement and results faster than end-tidal carbon dioxide. 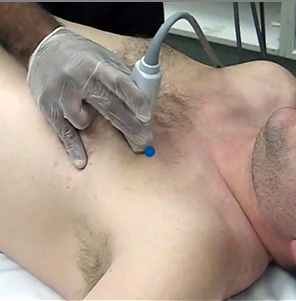 Ultrasonography is a good alternative for confirming the endotracheal tube placement. Future studies should examine the use of ultrasonography as a method for real-time assessment of endotracheal tube placement by emergency physicians with only basic ultrasonographic training.